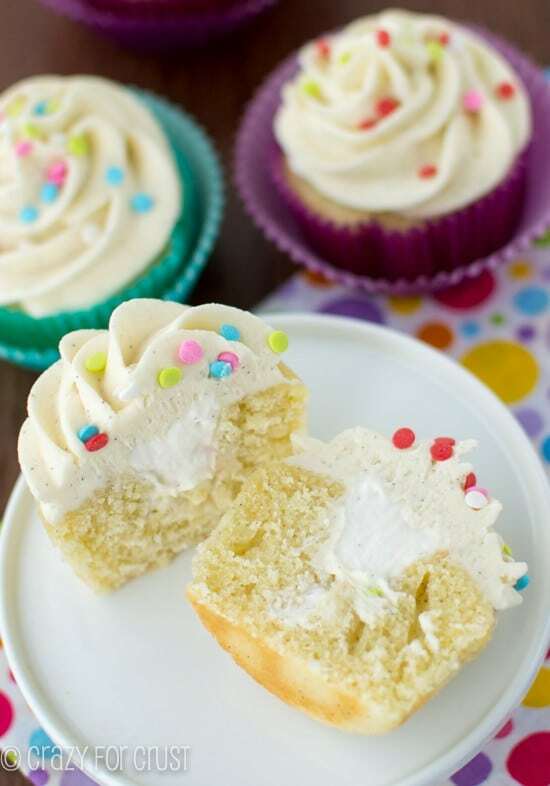 They might be plain vanilla, but these Vanilla Cupcakes are perfect, and are perfectly complimented with the vanilla buttercream and whipped cream filling. I know. A plain vanilla cupcake? Like…what? If we’re being 100% honest with each other…I prefer a vanilla cupcake. 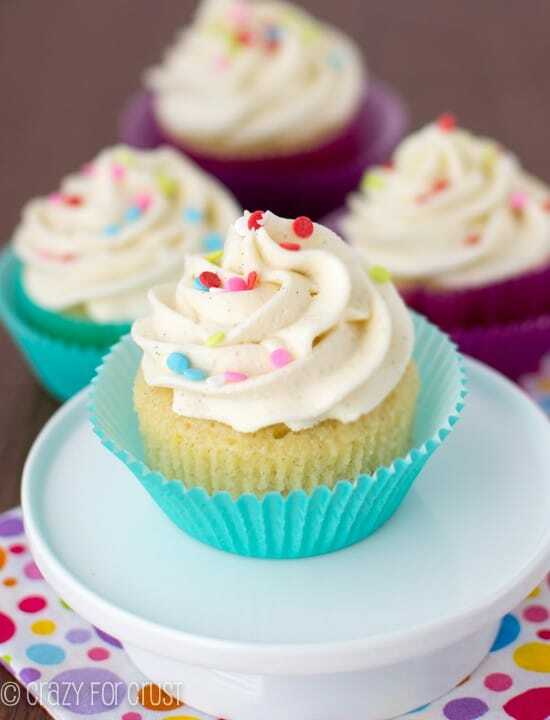 A simple, rich vanilla cupcake and a super vanilla-y frosting. I’ll take this kind of cupcake over chocolate, peanut butter, or any other flavor. As crazy as I like to bake, as much as I love to make rich food, there’s something about the simple flavor of vanilla. I love it! And these Perfect Vanilla Cupcakes totally deliver. As you probably know, last weekend was my birthday. I was out of town (at the Duncan Hines Test Kitchen, so much more on that coming soon) so the family and I celebrated my birthday early. 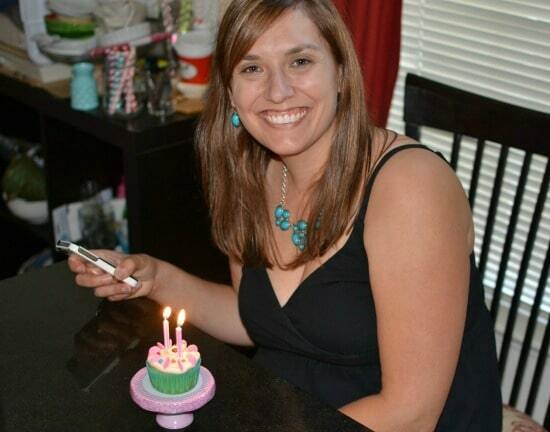 I had a full fake birthday, complete with presents, a movie, and dinner. Of course, Jordan wanted to make me some cupcakes. Mel, on the other hand, wasn’t so sure about helping her do that. So we compromised – I made the cupcakes and frosting and then they decorated them for me. I left out the sprinkles, candies, and mini marshmallows and left for the gym, certain my kitchen floor would be a myriad of colors when I returned. Now, I just had to include this photo. One, because it shows how Jordan decorated my cupcake. And two, because this photo speaks volumes about my life right now. Can you see what I mean? 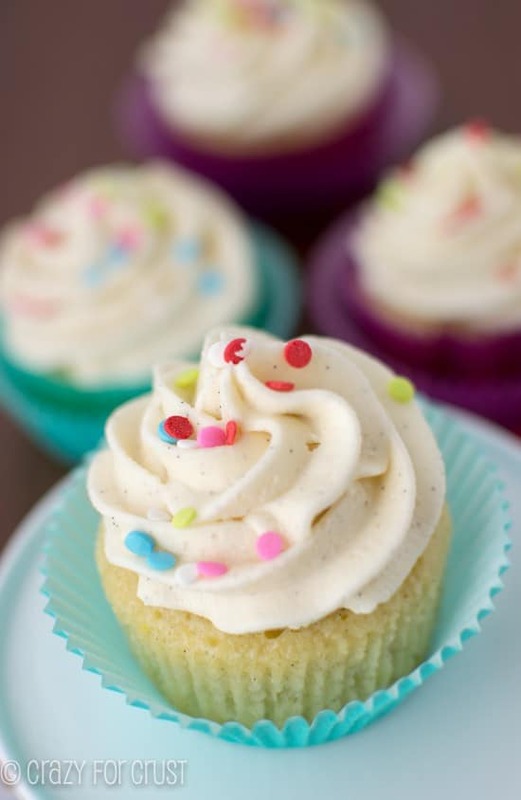 These Perfect Vanilla Cupcakes are just that – perfect. Normally I avoid homemade vanilla cupcakes because they’re always to dry, tough, delicate, hard, etc. Box mixes are just so easy – and they’re always perfect. But, since I don’t have a vanilla cupcake recipe here, I wanted to try my hand at it. It uses all-purpose flour. Many recipes call for cake flour. That’s all well and good, but I don’t want to buy special flour. This makes these easier, and more accessible for the regular home cook. But, it does include unsalted butter. All the recipes I looked at specified unsalted. I normally use salted butter, because it’s what I’ve always bought and eaten. However, if every single cupcake recipe I find uses unsalted, then I better go with the masses! In the past I’ve used butter in cupcakes and they’ve been dry and tough. Oil often makes them too weak to stand up to a load of frosting. So I remembered a tip (from, I believe, my friend Sally) to use melted butter. It made a huge difference!
. I love the vanilla flavor it puts into things, and you still get those little black dots all over the cupcake and frosting from the beans. The frosting is my favorite too – a pure vanilla frosting. I whip butter with powdered sugar, add more vanilla bean paste, and some heavy cream to get it to the texture I like for frosting. It’s all sweet and vanilla-y and perfect! This frosting would be awesome on chocolate cupcakes too. 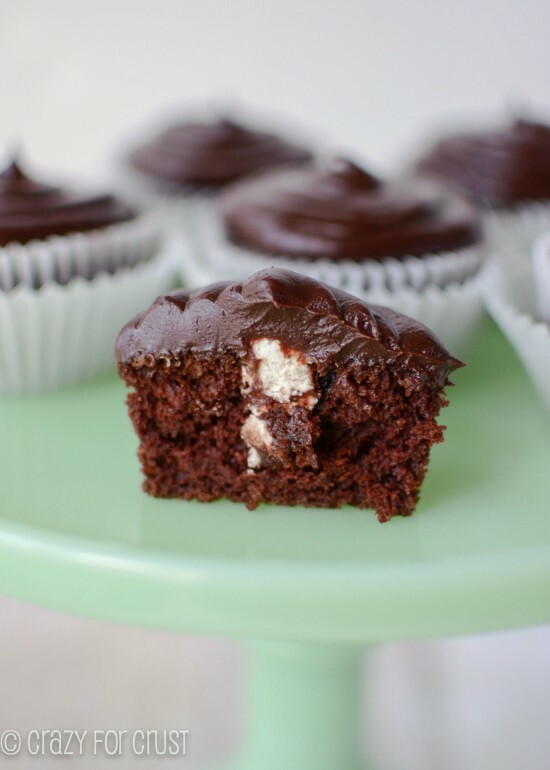 And the cupcakes would be awesome with chocolate frosting, or even caramel frosting! I also filled these with a simple whipped cream, sweetened with powdered sugar and, you guessed it, more vanilla bean paste. I cannot get enough of that stuff! The filling is a total option, but if you want to add a little something extra, go for it. My mouth is watering for more. 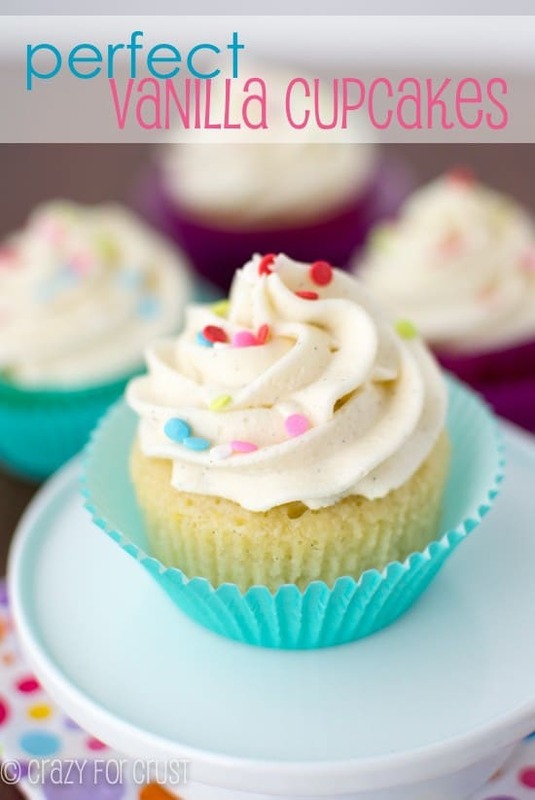 Vanilla is one of my favorite flavors…especially in Perfect Vanilla Cupcakes! Preheat oven to 350 degrees. Line cupcake tins with liners (makes 12-15). Whisk flour, baking powder, and salt in a medium bowl. Add melted butter to a large bowl and mix in sugar with a hand mixer for 30 seconds until thick and yellow. Add eggs one at at time, beating after each addition. Beat in vanilla bean paste. Add the flour mixture and buttermilk alternately, starting and ending with the flour. Don’t over mix! Divide batter among liners, filling 2/3 full. Bake for 15-20 minutes until a toothpick comes out clean. (Mine took less than 20, so check at 15!) Cool completely before frosting! To make the filling: beat heavy cream and powdered sugar until stiff peaks form. Whisk in both extracts. To make the frosting: Beat butter until creamy. Beat in salt and 1 cup of powdered sugar at a time until it’s all added. Beat in vanilla bean paste and 1 tablespoon of heavy whipping cream. Add more cream as needed for desired consistency. 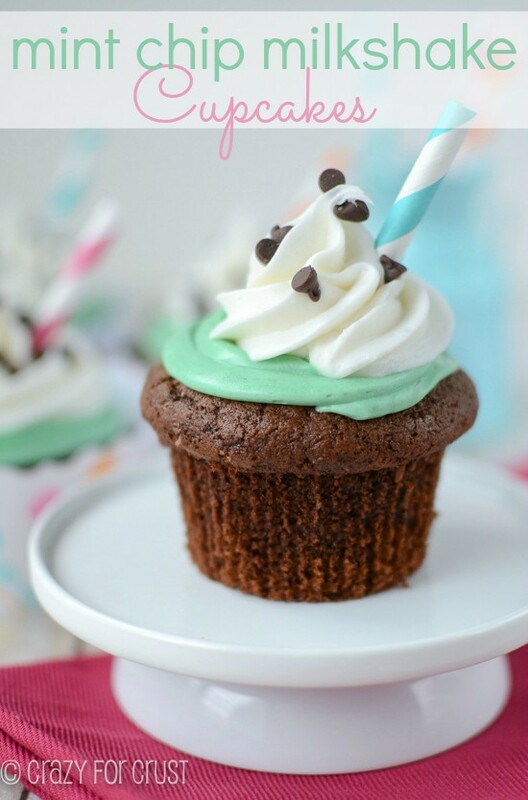 To fill cupcakes: you can either fill a pastry bag fitted with a round tip and poke it into the center of the cupcake to fill, or you can carefully cut out a hole in the center and fill with a spoon. Frost cupcakes by placing frosting in a pastry bag. I like the 1M tip, it gives pretty swirls. Add sprinkles for fun! Note: you can make the frosting the day before, but let it come to room temperature before using. Find vanilla bean paste on amazon, or at stores like William's-Sonoma or Sur la Table. Although I didn’t have ingredients to make the filling.? I’m so glad he enjoyed them! Always my “go-to” vanilla cupcake recipe. I have been using this recipe for 3 years now. I love the use of buttermilk. These cupcakes are always super tasty and moist. I love the density too!! These cupcakes are dangerously addicting! I’ve been baking cakes forever and am so excited to have tried a new recipe. These are AMAZING!!!!! I made them twice last week! Only recipe I’ll be using from now on and the frosting is just as good! LOVE LOVE LOVE this!!! So sad my cupcakes tasted like sweet scrambled eggs. Not sure where I went wrong. Could I make this recipe with liquid vanilla extract? Definitely I’ll tray yours recipes very soon. Thanks for the effort you put in change some ways to make the cupcakes. 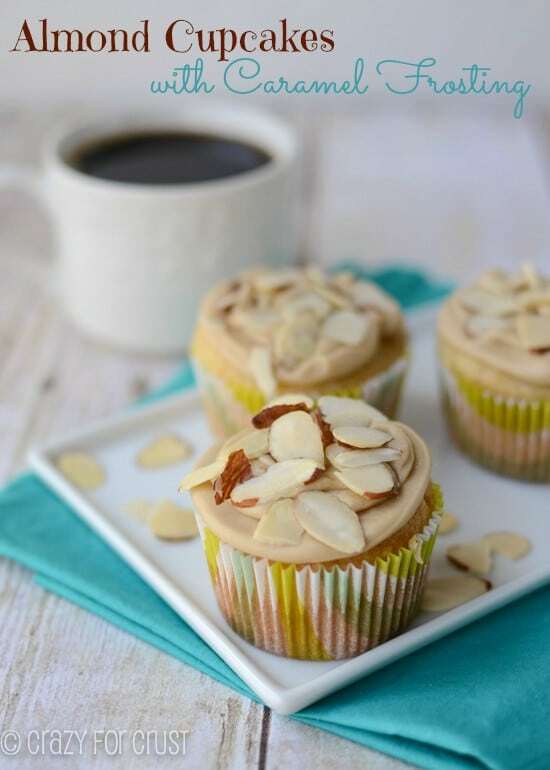 Can I add a little almond extract to the vanilla cupcake recipe? How do you change up this vanilla cupcake recipe to use for the “east triple coconut cupcak” recipe? I don’t want to waste ingredients by having it bomb! Thanks!